At Saga Education, we know the relationships young people can count on are the ones that lift them up. So our professional Tutoring Fellows offer consistent, personalized, in-school-day academic tutoring -- delivered with equal parts accountability and heart. 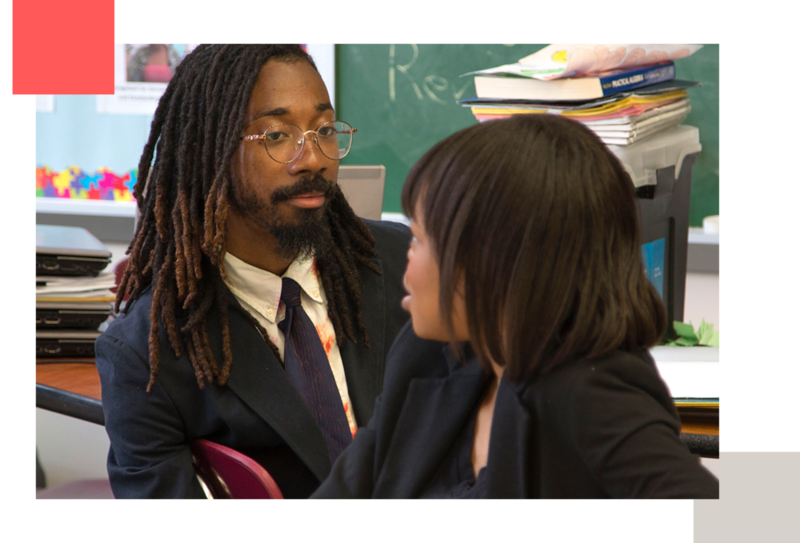 Whether they are supporting students to work through a tough math problem or a tough day, our Fellows help busy teachers by focusing on the students who need it most. And, together, they get results. Rigorous research has proven time and again that, for under-served students from Chicago to New York, Saga Fellows help raise academic growth. All while raising the social and emotional well-being students need to learn and thrive over a lifetime. Saga Education will help eradicate educational inequality by becoming a leader in working with educators to envision a new story where the power of personal relationships nurtures academic, social and emotional growth for young people. Saga Education serves historically under-served young people through personalized, consistent, caring and best-in-the-world tutorials that result in youth gaining confidence and academic strength so that they see, pursue and realize their grandest dreams. Coming from a home where education was a top priority, Kaila Epps set her goals toward college at an early age. She originally wanted to pursue medical school, but what began as an initial gap year of service changed the course of her professional career forever. For our first segment of this series, we focused on Fellows that chose to take a break between their undergraduate and graduate studies. The hands-on experience Karlyn got as a Saga tutor forged a lasting personal connection to the education issues she now researches professionally. A native New Yorker, Mark Cort knew that he wanted to give back to the community similar to those in which he was raised before dedicating his time to himself and to medical school. The first semester is over, and SAGA Fellows are halfway through their year of service. Time has flown by! This month, we caught up with Jeffrey Antoine to hear about the SAGA experience from a first-year Fellow’s perspective. During her years as an ethnic studies major at the University of California, San Diego, Danielle Bulante built a passion for social justice. This year-long opportunity to work with students in Chicago and New York gave Lucy a chance to connect with students while helping to narrow the achievement gap. Before moving to the United States several decades ago, Dan Heymann was a musician touring in his native homeland of South Africa. As Paul Betz neared the final years at his long-standing career in the Chicago area, he considered shifting from the corporate world towards a teaching position.